This last week I took on a new challenge when I raced Ultraman Florida. It's a 3 day event... day 1 is a 10k swim + 90 mile bike, day 2 is 171 miles on the bike and day 3 is a double marathon. I led the swim/bike and started day 3 with a 56 minute lead, which was reduced to 27 minutes by the end of marathon #1. I had no option but to maintain my pace through to the end and claim victory by a whisker of 8 minutes. It took me about 6 IMs before I really figured out how to execute one well, but I'm happy to say that this race was almost perfectly executed in terms of strategy and pacing. This game has huge mental elements, where you really can fail or succeed by the state of your mind and the minute-by-minute decisions that you make. I had an awesome crew on tap - Kevin Coady who knows me as an athlete better than anyone, and Chris Blick + Ethan Davidson who drove the Dimond Van down from Des Moines Iowa to crew for me (complete with an identical bike, which as you will find out came in very handy!). We also had a guest appearance by TJ Tollakson who caught an Uber to intercept me on the run course and do some cheering! Herbert started off with some good Q&A here - please ask me anything you'd like to know! Awesome race, very strong effort sir. Have you done any aero testing? In particular, I am very curious to see if you're gloves or shoe covers had any measurable results. Also, do you always race with GP4000sII? or with the added distance did you opt for more durability? oh boy, have I done aero testing! I should probably have a loyalty card from Jim @ ERO ;-) the only thing I haven't tested are the shoe covers. That decision was based on a guess that they would be faster than the naked tri-vent shoes, plus it was a bit cold at the start. The Castelli Body Paint suit is fast, but is impractical for a tri because it takes so long to put on. This was the ideal opportunity to wear it. On day 1, I wore my usual LG M2 suit with the sleeves rolled down under my wetsuit. In aero testing that has tested as fast as the PI Octane for me, but it's easier to get into. These days I race with Turbo Cottons, which I did bring with me. On day 1 I decided to use the GP4000sII because there was debris on the roads and I was planning to ride easy anyway. That was a good decision, so I just kept them on for day 2, and I'm glad I did. There were some horrendous road surfaces (and some fantastic road surfaces) and I would make the same decision again next time. Originally I was planning to put on the Turbo Cottons for day 2. By the way I also ran a 25mm GP4000sII on the rear, at a slightly lower pressure than usual, which I was also glad I did. Any details about the gloves? Were you able to get any quantitative results with them? I've been thinking of trying them since it would be pretty easy to throw on during transition. Again amazing effort man, good luck in Hawaii! No I need to test those ones. I did some informal chung testing where they seemed to be slightly faster than nothing. With this type of event I wanted gloves (8 hours is a long time to ride a bike! ), so I chose these. I also have the LG aero gloves, which are nice but seemed a little slower than the castelli (again not with a very controlled test, but both were faster than bare hands). They are pretty tight - I'm not sure I would use them in a tri unless I could easily slip them on while running to the bike or something. I think for things like the gloves etc. a real wind tunnel test would be a good idea. I'll try to get some testing in over the summer. Congratulations and great race! It looks like your swim pace was very similar to your IM swim paces from recent years. What is the secret to more than doubling the distance and not really slowing? Was the bike course completely open to car traffic (i.e. did you have to yield at stop signs and when turning, etc.)? Your run splits (based on your Strava file) are amazingly consistent for having incorporated some walking as you said. Did you not make any potta-john pit-stops? What was your run nutrition plan? May as well congratulate you on another forum. Should have them all covered by now. Excellent performance! Did you stick with your latest IM nutrition on the bike for the ultraman? and, did you need to stop on the bike for the long drop? Well, the swim is very tranquil to start. I'm sure we all waste a ton of energy fighting in the mass start. So I was super relaxed, but just pulling steady. I didn't do nearly enough swim training, but what I did do, I made count. Basically I built up to regular 4k swim sessions (where I was averaging about 1:28-1:32 / 100m) most intervals of 200m or less, but with a few days of long intervals (like pyramid of 1000,800,600,500,400,300,200,100) or 8 x 500 type of workouts. I built up using my patented "just in time" principle to 7km, 7 days out from race day. That session was 3k warm up before masters, then 4k of hard masters work. I swim at Colorado Athletic Club Boulder, and they don't show much mercy. Yes. On day 1, I got caught at about 12 red lights in the first 20 miles. 2nd place was 4-5 mins behind me out of the water but caught up to me at the lights. It's just part of this type of racing. Day 2 was much better I only got caught at 2 lights (mostly because there are very few on day 2). An athlete got DQ'd for not stopping at a stop sign, so it's not something worth taking a chance with. On day 1 we rode for ages down this highway, with massive wind gusts. That was pretty hairy, having trucks flying past with the wind knocking you all over the place. I made one poop-stop just as we were ending the rural section, and about to enter a suburb. I didn't really need to go desperately but I figured I may as well go now behind a tree, then destroy someone's nice lawn when I was desperate. Nutrition-wise on the run, I only started the calories after about 10k, and it was liquid only for the most part (ginger beer, and later coke, and finally mountain dew towards the end). I prepared some sushi rice cakes (ala feed zone portables) but I just didn't feel like that stuff. I ate half a snickers bar too. For most of the run I was eating sour worms. These were awesome during the race, but my teeth are still sore now. I'm not sure what those things have in them but it feels like the enamel has been dissolved off my teeth. I also had one Glukos gel (they are nice and watery) and some of those Quic Disc things. The final 13 miles was just small regular shots of mountain dew and lots and lots of ice cold water. It was very hard to take anything in towards the end but I just forced it. No ways did I stop on the bike for the long drop! Champions are prepared to destroy both their clothing and their reputation in order to save minutes. Fortunately I think my body used every single calorie I put into it, so there was no long drops at all that day, even after then race. Thanks. I'm busy buying everything to try the nutrition you use. Also need to get my head around spoiling the clothes and cleaning the windscreen in traffic, need to wait until after winter, not sure it's a good idea to practice on the trainer. not sure it's a good idea to practice on the trainer. You mentioned that you will be doing ultraman Hawaii. Are you going to change anything like preparations, nutrition etc? I have read a few times people commenting that your personal commitments may be a blessing in that you spend less time training, you also mentioned that your volume was low for the ultraman. Is this something you will be applying? What was your average power for day 2? I need to step things up big time before Hawaii, mainly in terms of run volume and quality. 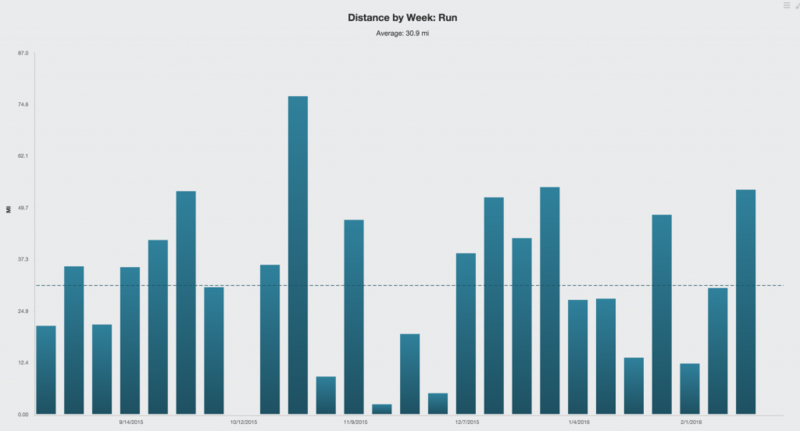 This is a chart of my run mileage since September. There is nowhere near enough consistent high mileage in there. Which brand of aero pad broke? Any reason as to why it failed...hit a pothole, too much stack height under the pad to the base bar, etc? Way to crush it! An excellent execution of a race plan and selection of support crew. Those Dimond guys rock. It was from a 3T Aduro bar, the same one that a P5 uses. There appears to be nothing wrong with the pad - it seems like the bolts just came loose on the rough roads, and then with the force I was applying on loose bolts, that stripped the holes and then the bolts popped out. I have zero stack of anything on my bike - no spacers and no stacks between the pad and base bar. So just the rough roads and continual force on that contact point. What is a light IM/UM training for you in terms of hours per week in each discipline? What's your favorite trainer session? the typical 20min repeats just below FTP or something more fancy? Do you use trainer road? What is your FTP in W/Kg? How many hours of sleep to you get per night on average? most of the time I do "91"s - 9 min on 1 min off, all programmed into TrainerRoad. I always start easy at 65% FTP, then increase the effort if I feel good. I had 2 sessions in December where I felt like superman and I was hitting those at 260-280 watts for each interval, for 2+ hours. about 4 w/kg at the moment. not enough. I have a Withing Aura which tracks it, and it usually tells me I get about 6 hours sleep, even though I'm in bed for 8 hours. At least once a week I have a great night of 7.5 hours. Last Friday I came down with flu and I slept from Friday night to Monday morning! Big congrats on the win. Also enjoyed your interviews with the IMTalk guys - was really excited to hear you won the whole thing after enjoying your first recent interview. What are some of your best tips on time management? What time of the day do you normally train? What did you have to sacrifice in order to train as much as you do? And how did you get there over time? Would love to hear some of your tips. thanks - yes the IMTalk interviews were fun! In terms of time management, here are a few tips. I think I need to do a blog post with all my thoughts on the matter. I've definitely changed my perspective over the past few years, and it's required a very different approach since my kids were born. 1. Always do the most important workout first thing in the day. Actually, this tip carries over to other things too. At work, do the most important things first. But for workouts, I either do a bike ride or a swim early in the morning (5am-9am or on shorter days 6am-8am). Runs are always shorter, so I just fit them in at other times of the day when I have a gap. 2. Since having kids, I can't reasonably justify spending all weekend training. So now, I just take half days off work in my key build weeks. For Ultraman Florida, there was some good time over Christmas when nobody was working much so I took advantage of that and did extra training (indoors for me since it was snowy outside). Then I took 2 half days the week before the race. On Wednesday I rode over 6 hours and I swam, and on Friday I rode 2 hours and swam 3 hours. 3. A "just in time" approach works really well (for me anyway). I actually have had better results just doing "real training" 8 weeks before a race, than the pre-kids days when I was trying to do 25+ hours per week all the time. So now, all I need to do is maintain enough fitness to be able to turn on and do a 25 hour week whenever I need to. As long as I'm fit enough to do that final training block, that's all that really seems to matter. 4. People watch way too much TV - it takes up so much time. Most of my TV watching is done on the trainer. 5. Commuting can be a great way to train. I actually recently sold my car so that I don't even have the option to drive it. Whenever I go to work I ride a bike or run there. When I used to live in San Jose, I would ride a mountain bike to work which took me 2 hours each way. So a typical day would be leave home 6am, ride to work, swim, run at lunch time, ride back after work. That's like 6 hours of training on a normal work day! 6. Trainers are productive. If you are time crunched, riding on a trainer is a very good use of time because there are no stop lights, downhills etc. 7. Related to #6, I actually now use the wahoo fitness desk, and do most of my email reading on the trainer. So I can get up in the morning, spend 90 minutes on the trainer clearing out my inbox at the same time. That also means when I'm working, I'm actually doing useful things and not spending time doing emails. 8. After having kids, I found it was critical to be flexible. Things happen in unpredictable ways, and if you are fixated on getting your scheduled workout in, that just leads to stress which is not useful at all. 9. As far as possible, set up your life to enable better training. This is easier than people realize, and very possible with a bit of effort. We all have choices, and it's not always as hard as one thinks. For example, I now live in Boulder, on the IM bike course, with a very short commute and surrounded by great athletes that push me to be better. I could have stayed where I was before but I developed a plan to make that a reality. There are plenty of other examples... ST regular Dev Paul would often visit silicon valley for work, and we would meet up at 4:30 and ride Mount Hamilton before work. While all those other corporate guys were still in bed, we had done 3.5 hours of hard riding in a beautiful location. Those are all choices, that when added up, make a big difference. 10. I'm sure there is more, I will for sure do a post on that sometime. - I gave up an epic social life. I don't go out drinking with buddies or even just hanging with friends watching the game or whatever. If someone wants to hang out with me, they can get a bike and come ride with me. My social life is limited to a few "normal" friends and then people at swim group. And my mechanic. - From a family point of view, I don't think I have sacrificed anything. I don't put training above spending time with my wife and kids, because it's not more important. So I fit things around them, and they in turn are more accommodating when I really DO need to put in some epic days. Excellent and thorough answer, Rob. Thanks very much. Funny that you mention Mt Hamilton.. I live in San Jose like you did before and haven't climbed it in a while and was just thinking it's time to go do it again. What were some of your other favorite rides around here? What do you do when you travel and if you have to travel close to your race? Did it happen with your build up to UM Florida? I find that I can always get my running in, and sometimes swims as well, but I do find it hard to miss a week or longer of biking. Also, injuries.. Are you staying mostly healthy or do you adjust your training when you aren't? Calaveras road was one of my favorites. Fortunately I've been injury free. If I feel a "niggle" I always just stop. I try not to travel, but for example I had to go to NYC in Jan, where I could only run on the treadmill. I just embraced the situation and ran 2x per day, 5-6 miles each time. If I'm in a good area for training then I take an extra day and do a long ride or something. In hotel pools, I just do sculling which is great technique work. Congrats Rob on the win! UM is on my bucket list. I have a toddler and infant, so plan to wait a few years.